With a pair of notable exceptions, Kate Hudson looks remarkably like her mother, Goldie Hawn. 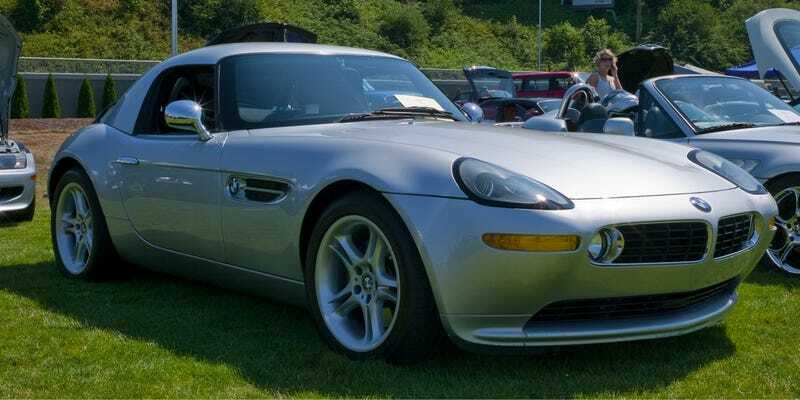 Today's Nice Price or Crack Pipe BMW Z8 was intended to evoke memories of its progenitor, the lovely 507, but its its price too reminiscent of its cost new? A couple of years ago when I was in Monterey for the Historics, I came across a remarkable sight - a row of what looked to me to be every BMW Z8 ever built, all lined up just outside of turn three. It was like some kind of wonderful Bimmergasm. However appearances can be deceiving, and as it turns out there were a little more than 5,800 of the retro-convertibles made in total, and nearly half of those came to America seeking a long-term relationship. One of those relationship seekers is now looking for a new sugardaddy, or momma, to take it home and keep it in fresh synthetic oil and premium gas. This 2002 Z8 in silver over black still wears its Henrik Fisker clothes like a boss, and comes with the hardtop, effectively making it a coupe when you want it, and a convertible when you don't. The seller claims the car to be in pristine condition, with the exception of a crack in the front bumper, and the pictures (which do appear to be two years old) seem to bear that out. Inside, the black leather is somber, but better than the harlot's lipstick red that came on some of the silver cars. Lightening things up in there, the instruments sit in the center of a swath of body-colored plastic arcing across the dash. The gauges address the driver, who sits behind a majorly cool three spoke banjo wheel, and in a seat bolstered not for hard corners but for autobahnstorming. For those of you not familiar with the Z8 - both of you - here's the rundown, in case you're ever actually run down by one. BMW's V8-powered 507 roadster, sold from 1956 - 59, has been lauded as one of the most beautiful cars ever built. The Albrecht von Goertz-penned body being lithe and lean in comparison to its portly sedan sibling. Many years later, BMW debuted the Z07 show car at the '97 Tokyo Auto Show, and its 507-emulating lines caused long lines at the first aid station due to its being knuckle-bitingly beautiful. The production version, the Z8, debuted three years later, and remained as Bar Rafeali-esque as was the dais darling. Situated as BMW's halo car in between the eras of the muscular 8-series and the freaky-deaky new-age 6, the Z8 sadly made the concurrent Z3 roadster look like a road turd in comparison. Under the Z8‘s long graceful hood, and behind the elongated twin kidney grilles rests BMW's S62 aluminum V8. At 4,941-ccs, and 32 valves, the Motorsport-built engine was shared with the M5 and pumped out an eyebrow arching 400 horsepower. Behind the music is a slick 6-speed stick, while holding everything together is an all-aluminum uni-body. That has been a point of contention between BMW and Z8 owners as there have been issues with structure deflection that could potentially make the cars kind of wonky over time. Cautious buyer is cautious. This car's 40,000 miles are respectably low, as are the miles claimed under the Michelin run-flats, and there doesn't look like there's any major gap issues in the hood or doors. The seller says that along with his Z8, the buyer will also receive some nice parting gifts, including a tonneau cover and a rack for the hard top, in case you want to try and make it talk. The Z8 originally came with a sticker just shy of $130K, and unlike most every other BMW model, these cars have lost relatively little in the way of resale value. Many are tracking near that original asking price, while this apparently lovely Seattle-located one - which comes with some desirable add-ons - has a price tag of $93,333. Sure that's a lot of double lattes at the Starbucks, but give up a couple of cups a week, and you could swing that, right? If you were to envision yourself as a Z8 owner, or were to contemplate the prudence of paying this seller's asking price as part of some sort of crazy car blog daily question, what would be your choice? Do you think that its $93,333 price makes this Z8 Z-GR8? Or, does that make your ardor for this Bimmer dimmer? BTW- If you can't see the poll try another browser or vote in the comments, it's all good. And remember, you can always email help@gawker.com for help.